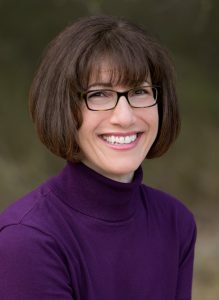 Please join me in welcoming uber-sweet (incredibly accommodating) Lucia DiStefano to our Interview series! 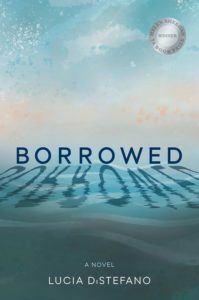 Lucia’s recently published debut YA novel, BORROWED, earned Elephant Rock Press’s 2018 Helen Sheehan Book Prize. A former high school English teacher and current ghostwriter/freelance editor, Lucia spends her days bringing words and wisdom to the world. Thank you for participating, Lucia! 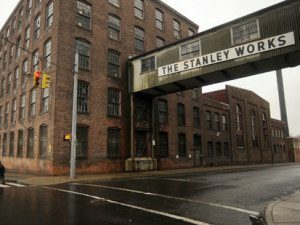 I grew up in New Britain, Connecticut, the home of Stanley Works and the former “Hardware Capital of the World.” As a child, I was fascinated by the seemingly constant activity within the nearby factories. (And the city’s motto — “Industry fills the hive and enjoys the honey” — certainly fits.) The Stanley Works plant was also close to the public library, so I spent many a long summer day oscillating between witnessing life in the pages of a book, and wondering about the lives of the people I’d see coming and going from the factories. I have been writing something or other for as long as I can remember; as far as “being” a writer, however, that came later, after stints as insurance agent, hobby shop manager, teacher (to name a few). Now, even when I’m not working on my personal projects, I’m writing or editing for clients. I feel lucky to be spending so much time with words. Hah. Good question! 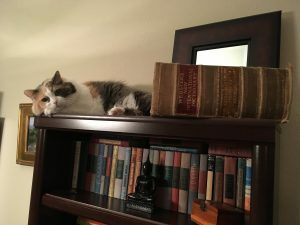 They’d witness lots of circuitous, one-sided conversations withcats and dog, much time-in-chair that would probably look like daydreaming for long stretches, and lots and lots of breaks for food. Oh, and on a really good day, an hour on the hammock with a book. As a ghostwriter and copywriter working under deadlines, I’ve had to become more disciplined than I’m naturally inclined to be. That has helped me put in the hours at the desk and not feel like it’s an unnatural place to hang out. 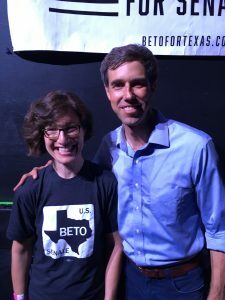 Although the result wasn’t what I’d hoped for, I’m proud that I worked on BetoO’Rourke’s campaign. It was the first time I’d volunteered for a political campaign, and yet I managed to push myself out of my comfort zone and do things that made my introvert self cringe (like door-knocking and cold-calling). I came back day after day (even after days where I allowed angry people to bring me down), and that’s what makes me proud: that ongoing persistence in the face of shaken resolve. That the uncertainty doesn’t go away. What I mean by that: I had thought once I received some type of extrinsic validation I wouldn’t be questioning myself so much (sometimes with a mean little voice) when I sat down to work. Each project stirs up all those same questions (“Can you follow this all the way through?” “Will anyone want to read this?” “Did you just write yourself into a corner?”), and I’m learning to make my peace with that as part of the process, rather than expecting that insecurity to disappear. Would you rather have a magic carpet that flies or a see-through submarine? I’m not so great with heights (hee hee), so I’d have to go with the sub. Would you rather only be able to walk on all fours or only be able to walk sideways like a crab? All fours, all the way. Would you rather be able to speak any language but not be able to read in any of them or read any language but not be able to speak any of them?